As our Canadian nights get cooler and longer, the summer Milky Way is sinking fast in the south western sky. This is your last chance to enjoy the Lagoon Nebula along with the ringed planet Saturn. At the beginning of the month, they disappear by 10 p.m. local time. Even Jupiter disappears from sight by 8:20 p.m. but we still have Mars till about 1 a.m. Although our distance still increases with every passing night, its global dust storms is subsiding and allows us to observe and photograph its surface detail. Venus is getting close to the dangerous solar glare and will be at inferior conjunction on the 26. Although we say farewell to most of the naked eye planets as they are lost in the solar glare how about trying to locate the farthest planet of our solar system – Neptune. Discovered in 1846, Neptune’s magnitude is 7.82 and requires a telescope or at least binoculars to see this fuzzy blue object. Once the sky is dark, look for the bright star Fomalhaut rising in the southeast. Shining at first magnitude, it is the brightest star in the constellation Pisces Austrinus. Due to its low declination of -29.3 degrees, Fomalhaut rises around 7:30 p.m. local time and sets after 3 a.m. At a distance of 25 light years, it is home to the first ever directly-imaged exoplanet. Fomalhaut b was discovered by the Hubble Space Telescope in November 2008 and has been officially named Dagon. There is still controversy in the scientific community if Fomalhaut b is actually an exoplanet. The Saturn Nebula, NGC 7009 is a planetary nebula located an estimated 5,000 light years away. Its internal structure is produced by ultraviolet radiation from the hot core. The central star is in the process of becoming a white dwarf. 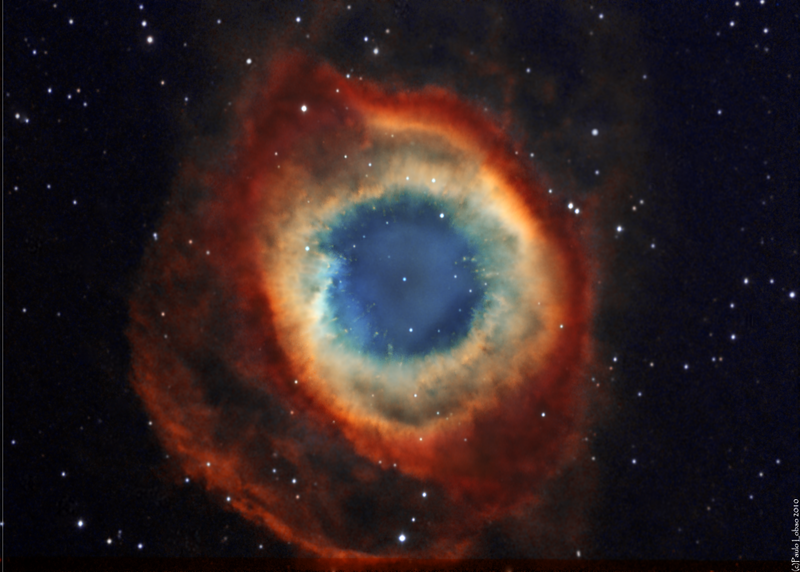 Moving over to the Helix Nebula, we see another planetary nebula but is much closer to us than the Saturn Nebula. At a distance of only 695 light years and close to three light years across, the Helix shows amazing structure and is sometimes referred to as the “Eye of God”. For the past month or so Comet 21P/Giacobini-Zinner has been a delight to observe and photograph as it passed through Auriga and open clusters M37, 36 and 38. This month it travels south along the eastern side of Orion. It orbits the Sun every 6.6 years and is the parent comet for the annual Draconid meteor shower might be worth observing. This shower will peak on the night of October 8-9 with the estimated 10-15 meteors per hour but recent years have shown a short outburst with higher numbers. This might be worth checking out. At the same time the South Taurids peaks ion the night of Oct 9-10 with only 5 meteors seen per hour. Upcoming in December, Comet 46P/Wirtanen discovered in 1948 orbits the Sun every 5.4 years. This object falls into the class of “hyperactive comets” and could be as bright as third or fourth magnitude on December 16. It will come as close as 11.6 million kilometres from Earth. This will make a great photo opportunity when it passes the Pleiades that same night. The zodiacal light is again visible in the eastern sky for a two week period starting from October 12. This faint angled column of light is the sun reflecting off interstellar dust. The light is seen around fall and spring. New moon occurs on the 9th (lunation 1185) and the full Hunter’s moon on the 24th.